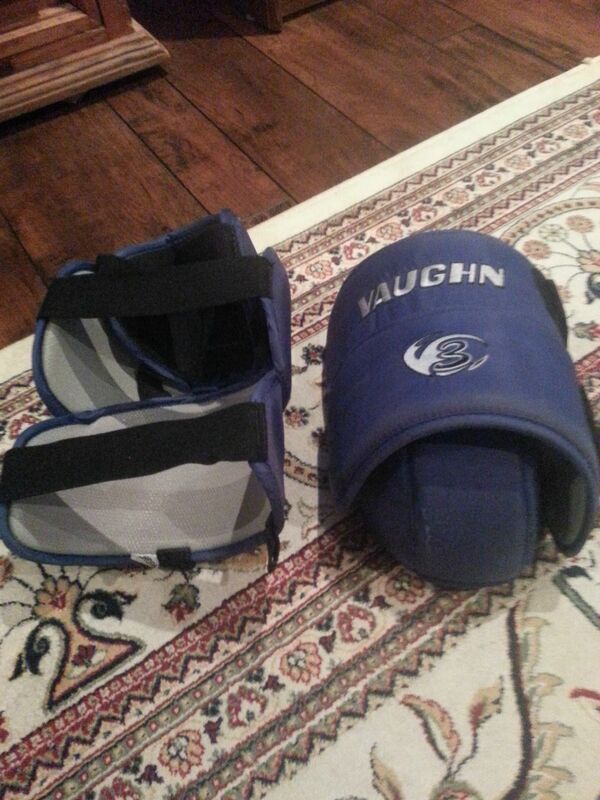 These pads are very similar to the Vaughn 7460 Knee Pads and Vaughn 1000 Knee pads. When I got these they were considered the pro mode, now they are considered the senior model. I have worn these with pads with an open leg channel and pads with a closed leg channel. My pants came with knee pads and a pair of my pads didn’t have knee protection. The pads are pro-return and have completely solid knee block with no cushioning on the landing gear, the pant’s built in knee pads were not big enough to cover the inside of my knee when I went down on the ice and I was getting bruised knees and feeling lots of knee pain from landing on the solid thick block of plastic the pads have. I needed something to help fix my knee pain and protect my knees and thus I bought these to in hopes of doing that. Fit: When new the elastic straps were tighter and these knee pads had less problems sliding around on my knee. 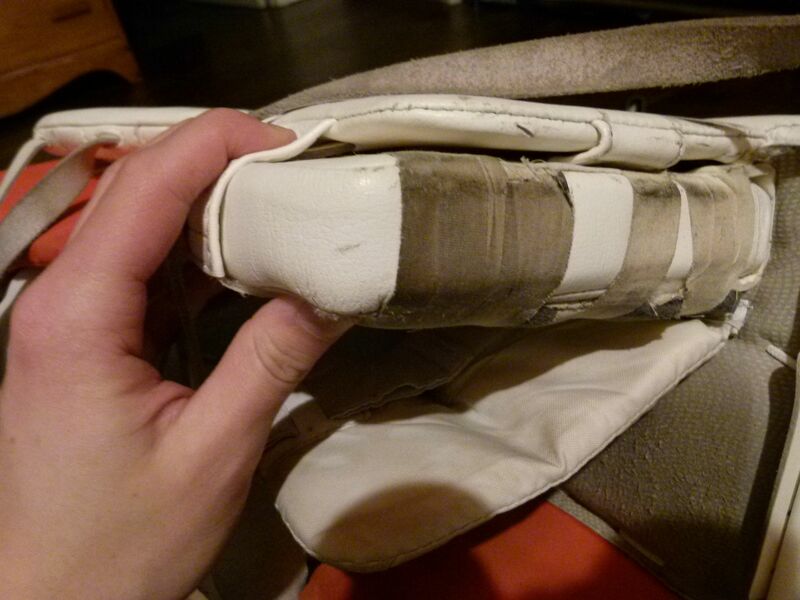 After about 3 months I was having trouble keeping the knee pads stable. Even with rubber on one of the elastic straps the pads would move a lot on my knee, there are tabs to connect to a garter belt but I didn’t want to head down that route. Instead I ended up wearing player socks over these attached to their own garter belt. 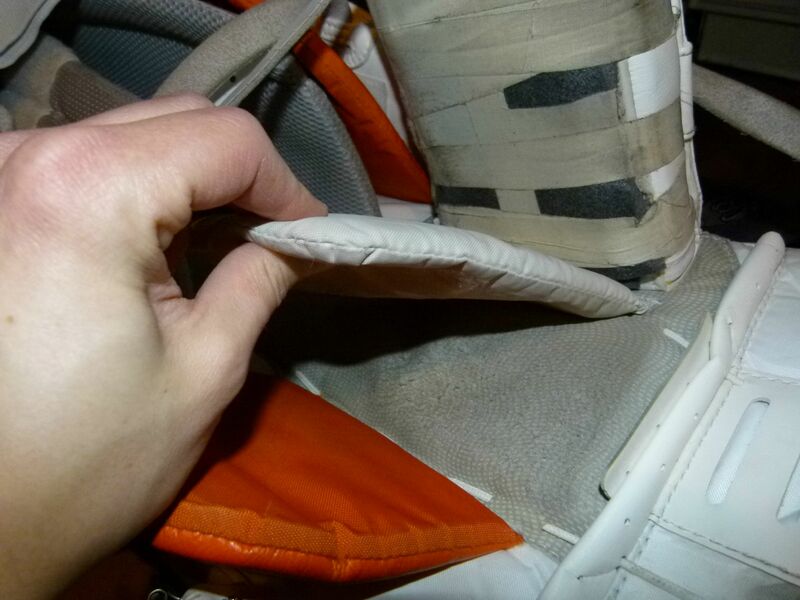 That made the pads tighter by the sliding issue was still prevalent. I then decided to tape below the knee pads and on the thigh portion of the knee pads. 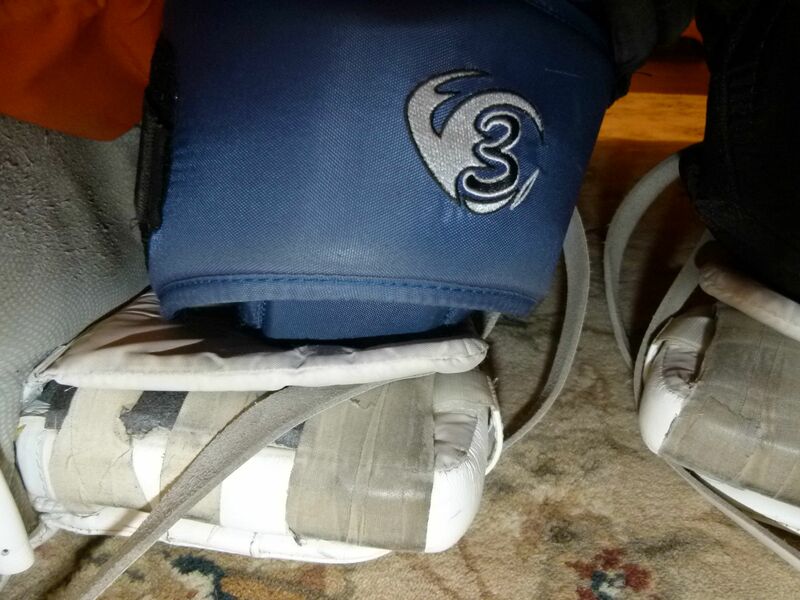 This kept the pads in place, and I later noticed I didn’t knee the tape below the knee pads at all. I would say these are medium size knee pads compared to other pads on the market, and I found them to be fine in an open leg channel pads but found them too big and bulky (thus awkward) for a tight leg channel. 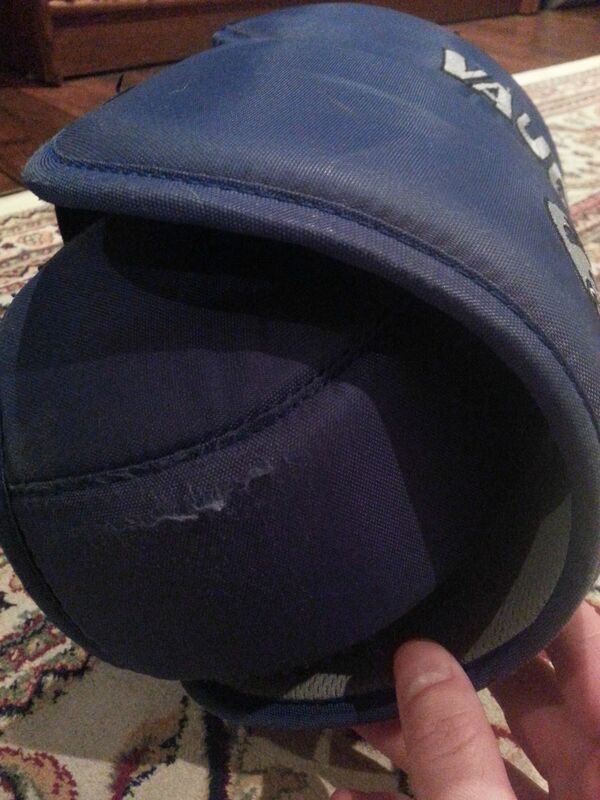 Conclusion: These knee pads served me pretty well for 2 years. I would’ve liked them to stay up on their own and not to have to worry about that. I also would’ve like them to last more than 2 years. I never got hurt with these so they did their job in that sense. For $30 they were a good deal, but for the full retail price there are much better options out there that offer more padding and features and I don’t think I could recommend them to anyone for $85. $30: 8/10, $84.99 3/10. This piece I am holding is solid plastic and is what was causing pain. This knee wing is super thin and flimsy and thus offers no padding when going down. The original owner added foam on the knee block as you can see here, but it doesn’t help enough. 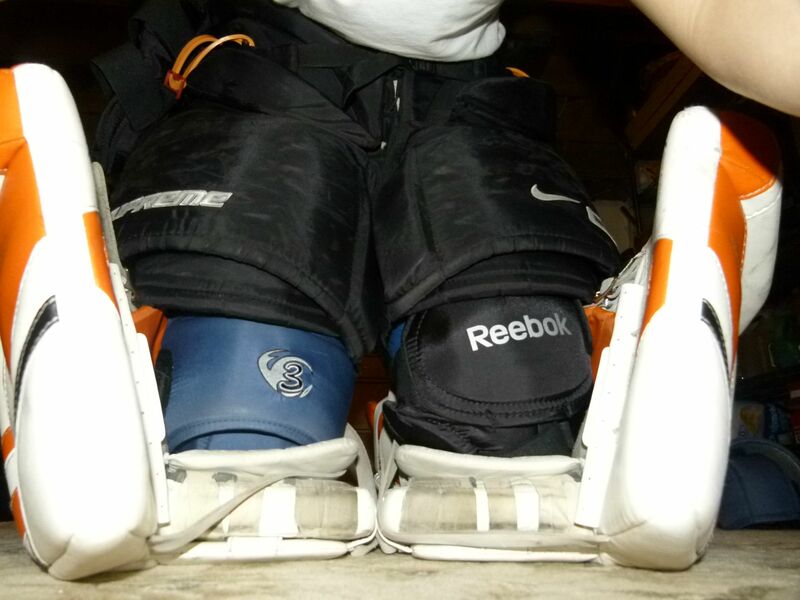 Here is how the knee pads look in the pads compared to the Reeboks I have. After 2 years the knee part against the knee wing shown here has worn down to the point that my knee started to hurt when I was just taking these photos for ~5 minutes.